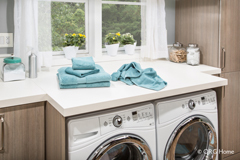 Laundry can seem like a never-ending, enduring task but you can make the space you sort, fold, and clean more enjoyable with ORG Home organization. 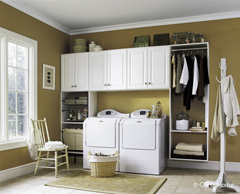 Houston Laundry Cabinet colors crisp white or calming ivory finish can create a serine storage space while wood grain cabinets provide warmth and can match your home decorating. 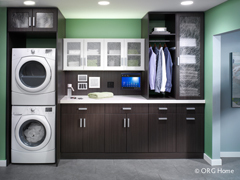 ORG Home laundry room organization is all custom designed and installed to accommodate any space, any size washer and dryer, and any size family. 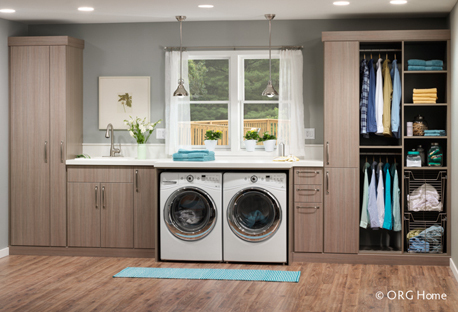 With storage baskets and pull-out hampers for sorting, cabinets and adjustable storage shelves for organizing, storage racks and rods for hanging clothes, and fold out ironing boards - an ORG Home storage system can handle loads. ORG Home's hefty 3/4-inch thick construction is made using commercial grade, color matched materials. 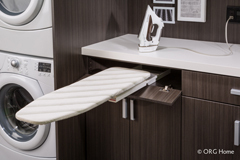 The Easy Track rail is so durable that one 8-foot closet system can hold up to 1,200 pounds when properly installed. Our system can be hung on the wall using the Easy Track rail, or mounted on the floor to give the appearance of built-in cabinetry. This, combined with 3 different drawer construction options, will give you a solution that is not only beautiful, but built to last. Using over 4000 different components, plus a complete custom capability, an ORG Home dealer can create a truly unique solution for any organizational challenge. Customize your enclosures with door and drawer fronts... complete your look with crown, base and other moldings for a custom built-in look. Add your choice of hardware whether it’s a standard, simple pull or one of hundreds of special order options. 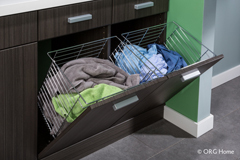 Design your solution down to the baskets, shelves, racks, hooks, drawers, rods, and even an ironing board and pull-out mirror.